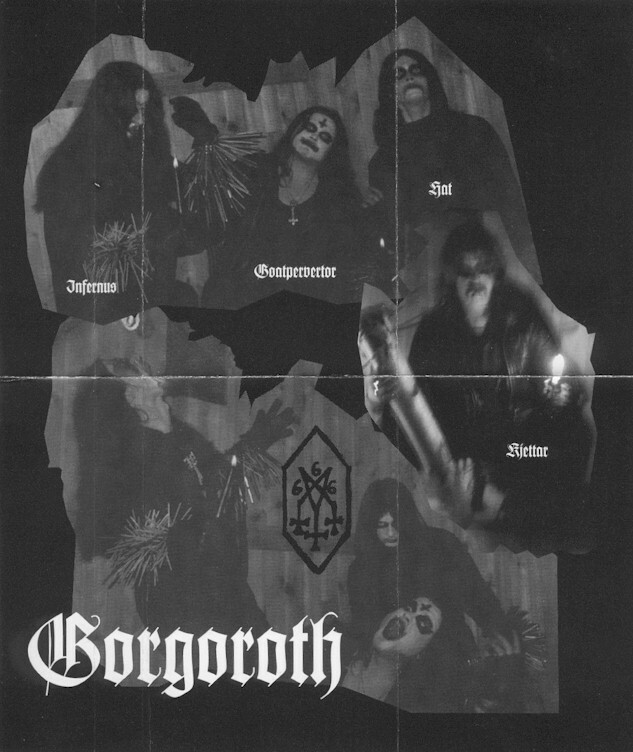 Arch Black Metal band GORGOROTH, named after the Tolkien mythical landscapes that breed evil and led by guitarist Infernus (a.k.a. Roger Tiegs), emerged in 1992 as a trio including vocalist Hat (‘Hate’ in Norwegian) and drummer Goat Pervertor. 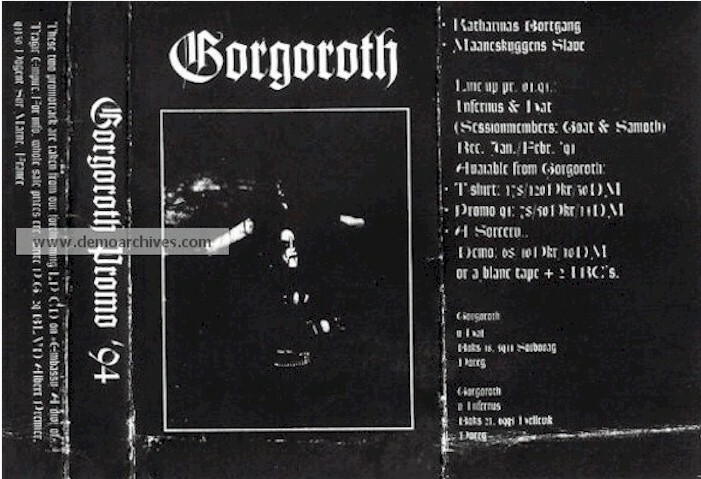 Having scaled the rankings in the latter part of the genres evolution, GORGOROTH is probably the only major Norwegian contender to still provoke establishment outrage by way of the outlandish exploits of the unit onstage and singer Gaahl’s frequent brushes with the law. The band, based in Hyllestad, debuted on April 28th 1993 with a demo, entitled 'A Sorcery Written In Blood', featuring two tracks ‘Sexual Bloodgargling' and ‘(Under) The Pagan Megalith' preceded by the intro 'Gathered At Blåkulla', actually a minute plus of incoherent screaming. 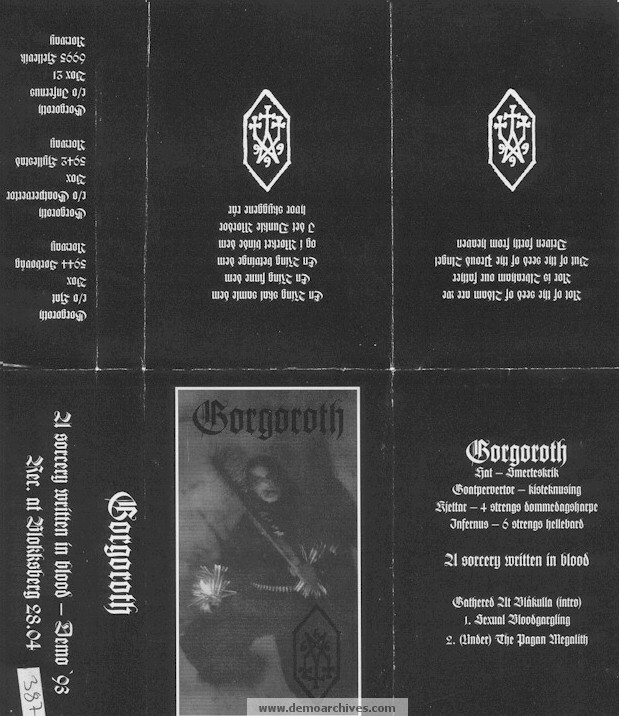 A further cassette, simply entitled 'Promo' 94', captured two more songs 'Katharinas Bortgang' and 'Maaneskuggens Slave'. 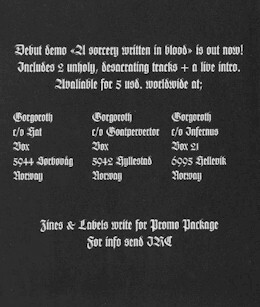 The opening 1994 ‘Pentagram’ album, recorded at Grieghallen Studios with producer Pytten (a.k.a. Eirik Hundvin) for French label Embassy Productions, featured EMPEROR’s Samoth (a.k.a. Tomas Thormodsæter Haugen) on bass, due to the group's original bassist Kjetter being imprisoned for his involvement in the burning of the 800 year old church Skjold Stavkirke. Pro printed covers. Cover folded out. On the back of the cover was a large band photo. Recorded onto regular tapes. Handnumbered.